The Heretics of the Shivering Isles are a group of outcast mortals found in Mania. They follow the Manic teachings of Arden-Sul to a fault, believing him to be the true lord of the Shivering Isles. They view Sheogorath as a mortal posing as a Daedric Prince, and seek to depose him for being unjust and insane. According to the Heretics, Daedra cannot be princes, only vile servants. As such, they specialise in summoning and binding Hungers to do their bidding. Their ultimate goal is to sack New Sheoth and force the other mortals to convert to their beliefs and live in the wilderness following the destruction of Sheogorath's mortal body. 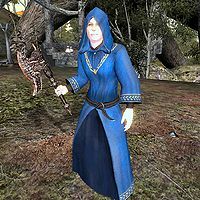 The Heretics are hostile towards most other inhabitants of the Isles, and wear uniform robes to distinguish themselves. They have a particular vendetta against the Zealots, their Demented counterparts. The highest ranks of the Heretics were said to be "transformed". Esta página foi modificada pela última vez à(s) 01h54min de 5 de fevereiro de 2015.